Upon election, Justin Trudeau promised that Canada would re-engage in UN peacekeeping. The Prime Minister gave explicit instructions to Defence Minister Harjit Sajjan to achieve this in a Mandate letter (12 November 2015). The government made major pledges at the Peacekeeping Ministerial in London, UK, of 8 September 2016 (pdf). The Prime Minister made additional pledges at the Peacekeeping Ministerial in Vancouver on 15 November 2017. After the third ministerial was held in New York on 29 March 2019, how is Canada doing on its promised re-engagement? This webpage tracks the status of implementation of these government promises on UN peacekeeping using easily measurable statistics, the latest figures, and benchmark data for key commitments. It draws conclusions for each promise and conclusions overall. Pledge: Up to 750 uniformed personnel (600 military and 150 police) (London Ministerial: pdf). This should be in addition to what Canada deployed at the time (112), as is required for the pledging conference (new contributions). So the total would be approximately 860 maximum. Current status: 192 uniformed personnel are deployed (UN figures, pdf). This includes the 144 Canadian personnel in the MINUSMA mission, a contribution that started in July 2018. The Canadian defence department (DND) frequently states that the number deployed in Mali is "approximately 250 personnel." The difference of between UN and Canadian statistics arises because Canada deploys more personnel than the UN pays for -- the UN has standards for the number of deployed for a given function that are lower than what Canada deemed was required. So the additional Canadian personnel (approx. 110) are considered part of a "National Support Element" (NSE), which is not reimbursed, though these personnel still wear UN insignia and are incorporated into the mission as part of the regular UN chain of command. Majority of military personnel are with Mali deployment (144, or approx. 250 including NSE). The non-Mali military contribution remains very small (23). And Canada is near the lowest level of police deployment: 25 in Haiti and 2 in Mali (added in February). Historical benchmarks: Canada was a leader in providing personnel to UN peacekeeping from its early days (e.g., providing the first chief of the first observer mission, BGen Harry Angle of UNMOGIP (Kashmir), created in 1948). Canada proposed the first peacekeeping force: UNEF in Egypt and made major contributions, including battalion-sized contributions throughout the life of the mission (1956–67). It also helped create the peacekeeping force in Cyprus (UNFICYP), to which Canada contributed large units (battalions) for about 30 years (1964–1993). Canada was the only country to contribute to ALL peacekeeping operations during the Cold War and remained a top contributor into the early 1990s. In 1993, Canada deployed 3,300 uniformed personnel in UN missions (incl. Bosnia, Cambodia, Mozambique, and Somalia). Canada contributed approx. 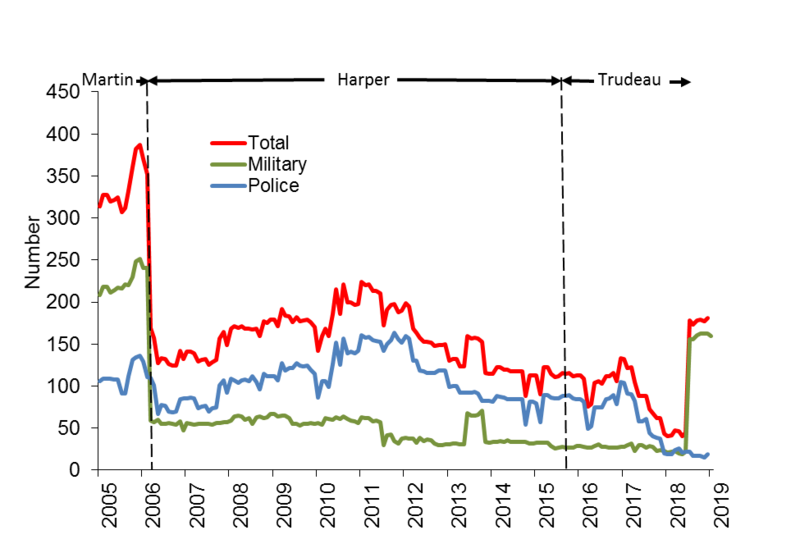 200 logisticians to the UN Disengagement Observer Force in Golan Heights (Syria) from its creation in 1974 until 2006, when the Harper government withdrew them (see decline in the above graph). 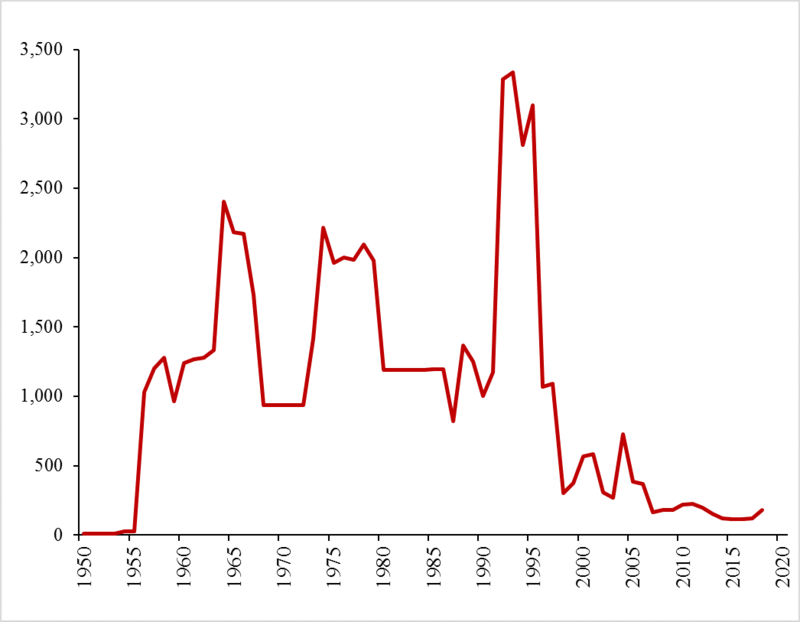 So during the half-century 1956-2006, Canada always maintained at least 200 uniformed personnel in peacekeeping, and the average for the period was well over 1,000 (see Figure A2 below). In March 2006, shortly after the Harper government came to power, the UN contribution dropped to 120 personnel. Before his election in October 2015, Trudeau criticized the Conservative government of Stephen Harper for a decline in number of uniformed personnel (rank 66th on the list of contributors in September 2015). But the Trudeau government let the contribution fall further for over two years until Canada reach its lowest rank ever: 81st (31 May 2018). The rank increased substantially in July 2018 with the addition of 134 mil personnel in Mali (as counted by the UN). The current rank is 59th (just ahead of Djibouti). Conclusion: Canada is finally contributing a military unit to UN peacekeeping, the largest since 2005 and only the third time contributing a unit since 2005 (both other units were in Haiti). The number of uniformed personnel deployed is now greater than what it was when the Harper government ended in October 2015. Canada has finally contributed some of the additional personnel promised in 2016. But instead of being at 860, Canada is at 192 uniformed personnel –– using the latest UN numbers (NB: Canada has assigned additional personnel to the air task force in Mali that are not under the Canada-UN MOU and hence not counted by the UN). Following the Defence and Foreign Ministers' announcement on 19 March 2018 that Canada will contribute to the UN mission in Mali, Canada has provided an aviation task force of 8 helicopters (three Chinooks and five Griffons). This is a substantial military contribution with high quality assets. The police contribution reached the lowest point since 1992 (just 15 police officers) in November 2018 (see Figure 1). It is currently at 25 officers, though the authorized ceiling is much higher (150 overall with 20 for UN mission in Mali, and 35 for misison in Haiti; see RCMP current operations). Promise: to promote more women in peacekeeping. Prime Minister Justin Trudeau: "We are equally committed to increasing the number of women that we deploy as part of UN peace operations." Vancouver ministerial, "Canada to deploy more women to peacekeeping missions, says Trudeau" (Youtube, 1:13). A specific pledge was "titled Women in Peace Operations Pilot – 'The Elsie initiative.'" The Trudeau government is providing only 35 women uniformed personnel: 18 military women in Mali, 2 military women in South Sudan, and 15 police women in Haiti (a substantial increase from 10 at the end of Feb) and 1 police women in Mali. This is more than the 21 women that the Harper government provided at the end of its term. If National Support Element in Mali is included, Canada's numbers of women increase substantially. Canada's 2017/18 Progress Report states: "Dedicated efforts were made to recruit women for the Canadian deployment to the UN Multidimensional Integrated Stabilization Mission in Mali (MINUSMA), resulting in women making up 14% of the Canadian contingent, including the task force deputy commander, and to ensure gender responsive action through the deployment of a gender advisor." Figures from Canada's Permanent Mission to the United Nations (PRMNY) are: Canadian females deployed as Staff Officers (SOs) and Military Observers (MILOBs) as of 1 Feb 2019: 3 of 30 (10%); and by end-Feb 2019 Canada is expected to reach 5 of 31 (16%). The number of women deployed as UN and National Support Element on Op PRESENCE (Mali) is 34 of 250 positions (almost 14%). The UN has a target of 15% (starting 2018 and increasing 1% each year thereafter to 2028) for SOs and MILOBs, and does not hold contingents to this 15% target. Gender Advisors (GENADs) are deployed with Op PRESENCE and UNMISS (South Sudan). The Government has released a 2017/18 Progress Report on its Women, Peace and Security (WPS) Agenda. It states: "Of the 45 Canadian police newly deployed to international peace operations during the fiscal year [2017/18], women made up 18%, as compared to 14% the previous year.18" [footnote 18: "Of the total 70 police in deployment during the fiscal year, women represented on average 19% in fiscal year 2017–2018 and 18% in 2016–2017. The target is 20%, which equals the UN goal."] It seems there has been some backsliding in 2018/19. – Elsie initiative: two countries have been designated to serve in a pilot project: Ghana and Zambia (Freeland, Sept 2018) but actual training and mentoring activities did not commence for over a year-and-a-half after the initiative was announced. The Global Elsie Fund is to be launched at the UN on 28 March 2019, over one-and-a-half years after it was pledged. – A pledge of C$ 21 m was made in Vancouver for WPS in UN peace operations. This includes contributions to the UN's trust fund for victims of sexual exploitation and abuse (SEA). Whether the funds were actually dispersed is not know. – More broadly, "A new WPS Chiefs of Defence Network was launched by Canada, the United Kingdom and Bangladesh to share best practices and compare progress in addressing barriers and challenges to integrating WPS in national militaries. Canada will succeed the United Kingdom as chair of the Network in [July] 2019." Pledge: While no specific pledge has been made in this regard, service at UN headquarters provides an important way to make a significant contribution, to gain experience in UN methods, procedures, and priorities, and to view the inner workings of the world organization. Positions to support UN peacekeeping should be in Department of Peace Operations (DPO) or the Department of Support (DOS). For the military, the placement would be within the Office of Military Affairs (OMA) within DPO. Background: Canada provided the Military Adviser to the Secretary-General (MilAd, who is head of OMA) from 1992 to 1995 (Maurice Baril, Major-General at the time, later Canadian Chief of Defence Staff). The last leadership post held by Canada in OMA was Chief, Military Planning Service (Col. Dave Barr, serving 2011-2015). Pledge: while no international pledge was made by Canada, the Prime Minister did request his defence minister to provide "mission commanders" for the UN. Canada has not yet done so. Historical Background: The UN's first chief military observer (BGen Harry Angle in UNMOGIP) and its first Force Commander (MGen E.L.M. Burns in UNEF) were Canadians. Canada provided seven force commanders in the 1990s but none since. Canada was offered the opportunity to submit candidates for force commanders in the D.R. Congo and Mali in the new century but did not commit. The highest ranking position in the twenty-first century has been the Force Chief of Staff (military) in MINUSTAH (Haiti), 2005-2017. Status: Canada lost its most significant military and police positions in UN missions with the end of MINUSTAH (colonel position as Chief of Staff) in 2017 when the mission was converted to MINUJUSTH. However, Canada did retain the role of police commissioner in the new mission. Canada lost the opportunity to provide the Force Commander for the Mali (MINUSMA) mission in January 2017 when it continued to dither and delay on the Mali mission,with Cabinet unable to commit. A force package for Mali was only delivered a year-and-a-half later. The Force Commander position went to Belgium and then to Sweden. Aside: On the civilian side, two Canadians host positions of mission leadership (Special Representative of the Secretary-General or SRSG): Colin Stewart leading the UN mission in Western Sahara (MINURSO) (since Dec 2017) and Elizabeth Spehar leading (since April 2016) the UN peacekeeping force in Cyprus (UNFICYP). But these leaders are not provided by or seconded from the Canadian government. They are part of the international civil service, individually recruited by the United Nations. Status: only one element of this pledge has been honoured (the aviation task force). All the others are not yet implemented. A transport aircraft unit (C-130) was promised for UN service, based in Entebbe, supposedly to be deployed by August 2018, but that plan is in limbo (CBC, 5 September 2008). So are the plans for the deployment of a QRF, though the Golan Heights is being examined as a possibility. Canada has for decades paid its UN dues "on time, in full, and without conditions," unlike countries such as the US, which regularly defaults in all three aspects (see Williams, 2018). Canada very seldom misses the January deadlines for payment of its mandatory UN dues, including the peacekeeping contributions. So Canada, under both Liberal and Conservative governments, is to be praised for this financial consistency in UN support. In addition, Canada is contributing advanced helicopters to the UN mission in Mali at a discounted rate, while also providing personnel (over 100) at no cost to the United Nations. In this one mission (MINUSMA in Mali), Canada is currently quite generous. In giving extra-budgetary (voluntary) funds to the UN, Canada is supporting some worthwhile projects, including the establishment of a training Joint Operations Centre ("mock JOC") in Entebbe, Uganda, to allow individuals to train on the UN's procedures, including the new Situational Awareness Programme. Mandate Letter: includes "leading an international effort to improve and expand the training of military and civilian personnel deployed on peace operations"
"Training activities to meet systemic UN needs"
No international leadership in peacekeeping training has yet been shown. The Canadian government is currently less well equipped to lead in training for UN peacekeeping since so few Canadian military personnel have deployed in such operations over the past two decades. In addition, the training and education within the Canadian Armed Forces on UN peacekeeping has also declined, with the number of activities less than a quarter of what they were in 2005 (see study: Dorn and Libben, Preparing for Peace? 2018, html or pdf or the longer 2015 version: html, pdf). The closure of the Pearson Centre in 2013 left Canada without a place to train military, police and civilians together. The Government announced on 29 May 2018 (International Day of UN Peacekeepers) financial contributions for peacekeeping training to two institutions: École de Maintien de la Paix Alioune Blondin Beye de Bamako (EMP Bamako), and Peace Operations Training Institute (POTI, US-based). Each institution was offered $1 million. This does not demonstrate international leadership but does assist these two particular institutions financially. The United Nations was counting on Canada to provide trainers for its courses at the Regional Services Centre Entebbe (RSCE) in October 2018 but Canada did not send the promised trainers. Also Canadian assistance to the Women's Outreach Course of the UN Signals Academy (UNSA), located at RSCE, has not yet materialized, even though the Elsie Initiative would seem to be an ideal source of funds, given the Initiative's goal of increasing women's participation in peacekeeping. Canada has announced that it will provide $500,000 to the UN for a Joint Operations Centre (JOC) simulation ("mock JOC") thta is planned for Entebe. The government does its own self-evaluation of the results of its promises (from the mandate letters) at canada.ca/results, which redirects to https://www.canada.ca/en/privy-council/campaigns/mandate-tracker-results-canadians.html. In October 2018, it listed the peacekeeping commitments as "Underway – on track" (defined as "progress toward completing this commitment is unfolding as expected"). In December 2018, this was changed to "Actions taken, progress made." The government's October 2018 self-evaluation that its peacekeeping promises are "on track" is inaccurate, if not outright false. The government's downgraded self-evaluation of "actions taken, progress made" (12 January 2019) is more accurate but also indicates how far the reality is from the promises. Only one mission has been added since 2015: the Mali mission, where 144 military personnel are deployed, according the UN numbers (31 March 2019, 250 if NSE is included). Ironically, the same month that Canada hosted a peacekeeping pledging conference (Vancouver, November 2017), the number of Canadian uniformed personnel in UN peacekeeping was lower than at any other point since the creation of the first peacekeeping force in 1956. It decreased even further in the months afterwards. Even with the recent increase (from July 2018) in Mali, the average Trudeau government contribution since it assumed power in 2015 is less than that of the previous government (on average 107 uniformed personnel for Harper government, 2006-2015). The Mali deployment may or may not signal a "re-engagement" in UN peace operations since the deployment of the aviation task force is relatively short-term (one year, far less than the nations that preceded Canada in that role). Canada announced on 19 March 2018 that it would provide the UN mission in Mali with an aviation task force of 6 helicopters and an aeromedical team. The deployment came to 8 helicopters after negotiations with UN headquarters. This substantial contribution became fully operational in August 2018 but the commitment was only for one year. Furthermore, it is not a complete replacement for the German capability that was withdrawn in June 2018 after one-and-a-half years of service. And the Mali contribution brings Canada to just one-third (roughly) of Canada's pledged military contribution (up to 600 personnel). Furthermore, the promised Quick Reaction Force is not deploying quickly, taking over a year since it was pledged, with no deployment date in sight. Similarly, a new mission for Canadian police contributions has not yet been announced. Canada reached the lowest police contribution since 1992 (15 personnel in November 2018) and has hardly increased since. The promised deployment of a C-130 (Hercules) aircraft to Entebbe, to serve multiple missions, is in limbo. Though August 2018 was the expected deployment month, it has not materialized and negotiations with UN headquarters are continuing. Furthermore, for a country that seeks to champion women in peacekeeping, it is not leading by example, with just 11% of deployed uniformed personnel being women, according to UN stats. The Trudeau government is not "back" and is not on track to meet its promises. Canada has not re-engaged, though a substantial commitment was made with the one mission in Mali. The rhetoric remains lofty on paper and in speeches but the Canadian government has yet to match its words with deeds. Canada is not leading by example and has defaulted on its own advice to the world: "The time for change is now and we must be bold" (Minister Sajjan's speech to UN Security Council, 28 March 2018). This webpage is updated on a monthly basis (around mid-month, after UN statistics for the previous month-end are released). The assistance Nic Baird and Dr. Danielle Stodilka in data gathering is gratefully acknowledged . A copy of this page can be found at peacekeepingcanada.com. 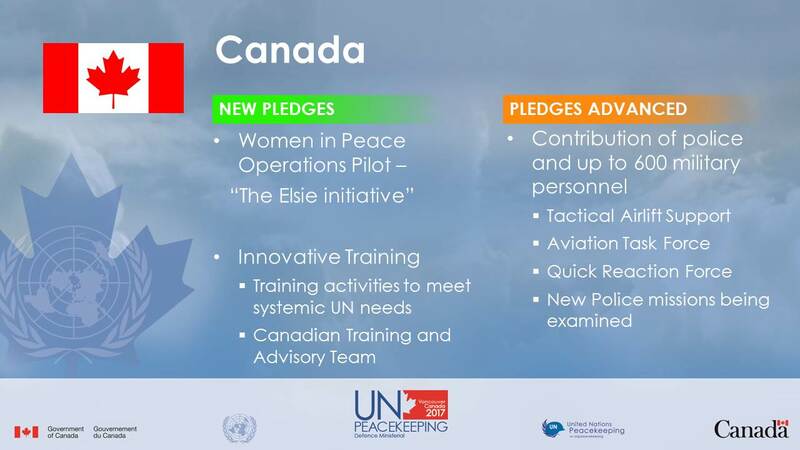 Canada, Department of National Defence (DND), "Pledges," 2017 UN Peacekeeping Defence Ministerial, Vancouver, https://www.canada.ca/en/department-national-defence/campaigns/peacekeeping-defence-ministerial/pledges.html. Operations Database: DOMREP; ONUC: ONUCA: UNDOF; UNEF; UNEFII; UNFICYP; UNGOMAP; UNIFIL; UNIPOM; UNMOGIP; UNTAG; UNYOM. Canada, Department of National Defence (DND),"Minister Sajjan Reaffirms Peace Operations Pledge at UN Defence Ministerial," https://www.canada.ca/en/department-national-defence/news/2016/09/minister-sajjan-reaffirms-peace-operations-pledge-defence-ministerial.html (quote: "Canada stands ready to deploy up to 600 Canadian Armed Forces (CAF) personnel for future UN peace operations. 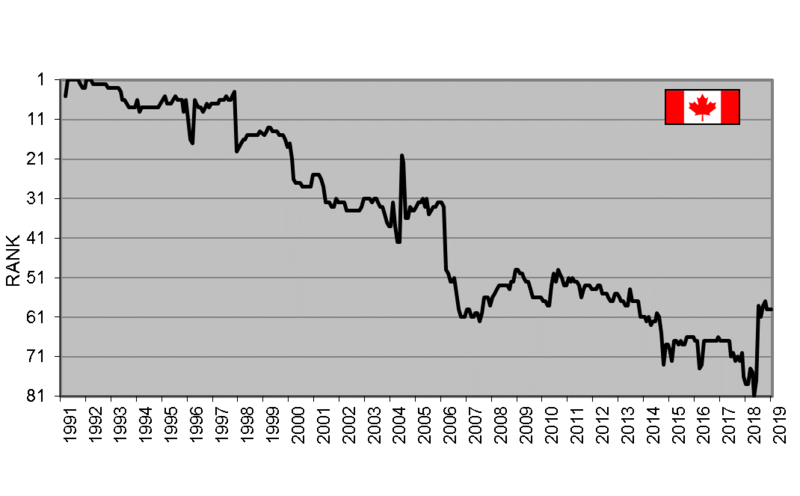 "), 8 September 2016. Canada, Privy Council, "Mandate Letter Tracker: Delivering results for Canadians," https://www.canada.ca/en/privy-council/campaigns/mandate-tracker-results-canadians.html, accessed 8 February 2018. Canadian Broadcasting Corporation, "Canada offering 200 ground troops for future UN peacekeeping operations," http://www.cbc.ca/news/politics/peacekeeping-plan-trudeau-vancouver-1.4403192, 15 November 2017. Trudeau Quote from Ministerial (15 November 2017): "We are making all these pledges today, because we believe in the United Nations and we believe in peacekeeping," he said. "What we will do is step up and make the contributions we are uniquely able to provide." Durch, William J., The Evolution of UN Peacekeeping: Case Studies and Comparative Analysis, St Martin’s Press, New York, 1993. Sajjan, Harjit (Defence Minister), Address to the UN Security Council, 28 March 2018, video at http://webtv.un.org/watch/part-2-collective-action-to-improve-united-nations-peacekeeping-operations-security-council-8218th-meeting/5760429007001/?term=, 42:00-51:44. Trudeau, Justin (Prime Minister), Minister of National Defence Mandate Letter (12 November 2015): https://pm.gc.ca/eng/minister-national-defence-mandate-letter. United Kingdom, "UN Peacekeeping Defence Ministerial: London 2016," https://www.gov.uk/government/topical-events/un-peacekeeping-defence-ministerial-london-2016. Final Report (pdf). United Kingdom, "UN Peacekeeping Ministerial - pledge slides (PPT)" (pdf), https://www.gov.uk/government/uploads/system/uploads/attachment_data/file/556825/Pledge_slide_show_-_final_for_media_2.pdf. United Nations (UN), "Troop and Police Contributors," https://peacekeeping.un.org/en/troop-and-police-contributors. United Nations (UN), Department of Peacekeeping Operations / Department of Field Support, "Current and Emerging Uniformed Capability Requirements for United Nations Peacekeeping," issued periodically, including December 2016 (pdf), May 2017 (pdf) and August 2017 (pdf). United Nations (UN), Department of Public Information (DPI), The Blue Helmets: A Review of United Nations Peace-Keeping, 2nd ed.. (New York, N.Y.), United Nations, 1992.